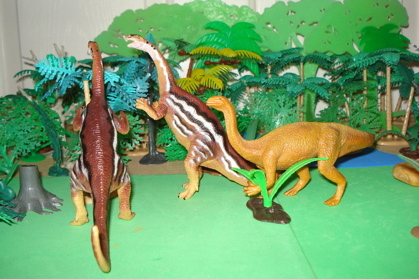 The Schleich Plateosaurus is one of the better looking Dinosaur toys. 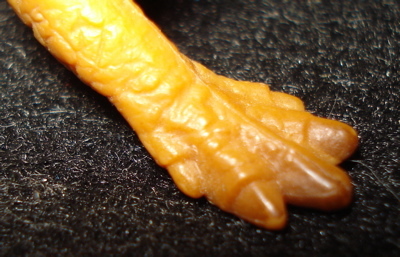 The detail on the Schleich Plateosaurus is really quite excellent as can be seen in, for example, the head (below left and below). The right front paw (Left) is just about perfect with the long thumb-claw, the three central fingers and small "pinky". The left paw (Above) is completely wrong! 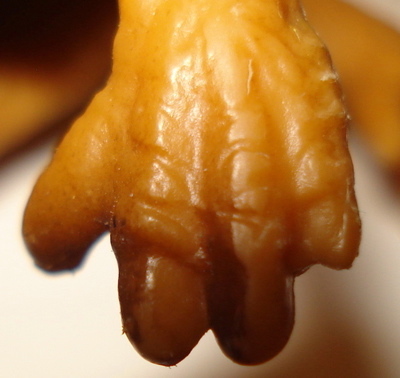 The thumb claw is smaller and there are too few fingers. How the heck did this happen? What a failure of quality control! I'm deeply shocked. I'll get over it. Don't worry. 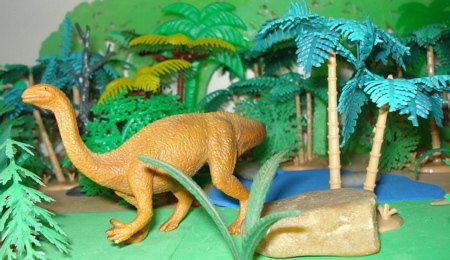 And that "good" right paw is down on the ground presupposing that the Schleich Plateosaurus is quadrupedal in nature. 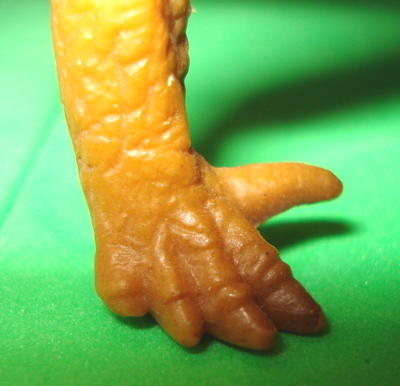 The feet, however, are superbly detailed (right foot detail- Right) and apparently both correct and consistent in form. 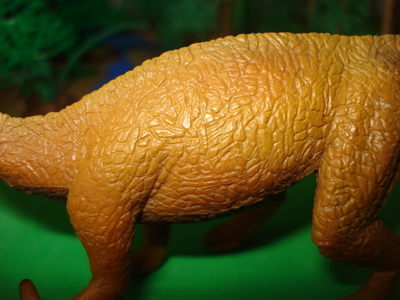 The "skin" (Below) is highly detailed throughout the entire Schleich Plateosaurus' body which is molded in a largely monochromatic yellow-tan plastic fading to tan down the back and darker brown on the belly. Interesting. 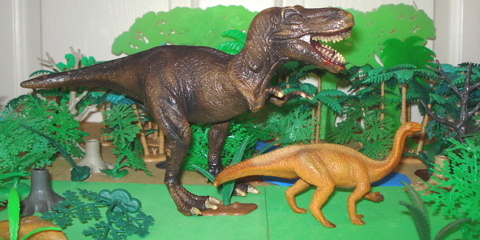 The Schleich Plateosaurus has its own problems with the introduction of the sinister 2001 Schleich Allosaurus (Above) and the block-headed 2004 Schleich Tyrannosaurus Rex (Below). 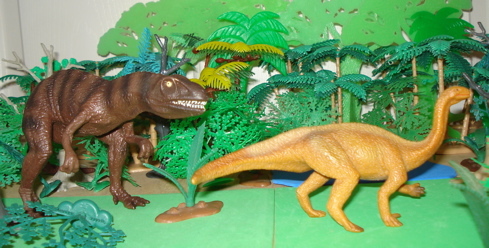 see the wonderful detailing and natural look of the unnaturally posed Schleich Plateosaurus. It looks so good in this quadrupedal position thanks to the elongated front legs. 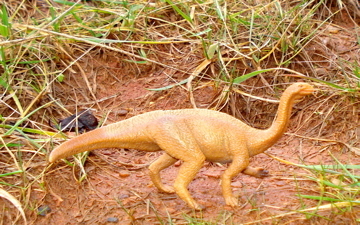 Given the many points of balance of this figure it can be readily posed rearing up on its hind legs, using the tail as the third leg of the tripodal pose. 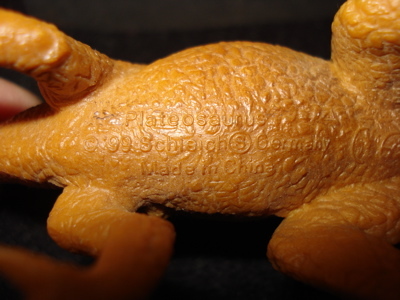 Even the manufacturers imprint seems to fit into the detail of the skin. It is clear yet not in any way intrusive to the overall "look" of the figure. The only thing I really don't like about this is that I have only the one. 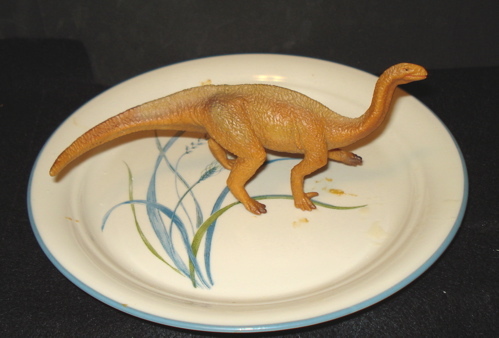 The Schleich Plateosaurus is and should be a herd animal and being all alone makes it particularly vulnerable, even to the 2003 Schleich Dilophosaurus. 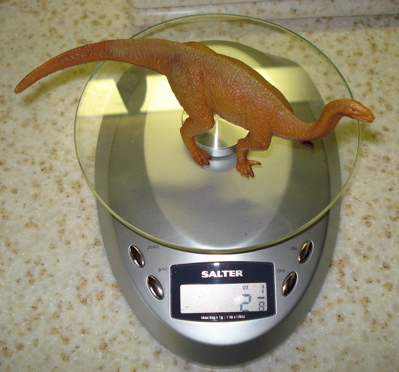 The Schleich Plateosaurus is an extremely well done and high quality example of how Dinosaur toys can go wrong. 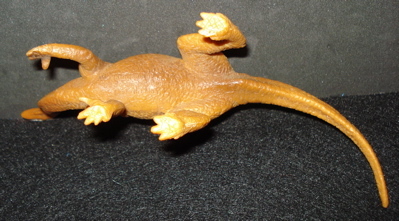 Its elongated forelegs, quadrupedal stance and misshapen left fore paw combine to take what would have been a high quality and realistic Dinosaur toys figure and just, well make it into a very, very nice Dinosaur toy. 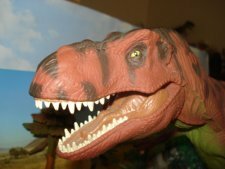 My (limited) experience with Schleich Dinosaur toys figures (as well as several prehistoric mammals) is that some are very good, others not so. The actual figure quality varying from realistic to exaggerated and toy like. 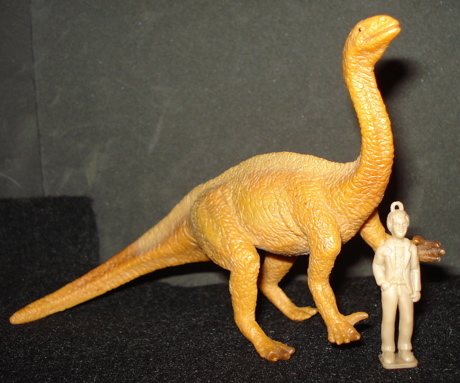 I think that this is marginal as a collectable (as different from an actual collectible) as its Dinosaur qualities and detail make it acceptable, but not a Plateosaurus. Out-of-production and not readily findable in a Google search on December 18, 2009.... What can I say. If you really want one you might find it as part of a lot of figures which is how I got mine (off ebay). 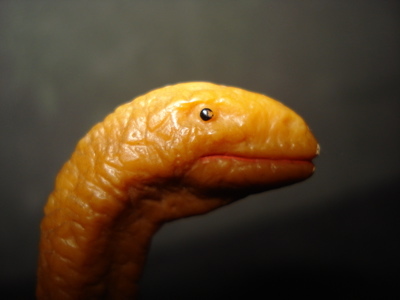 If you're "into" Schleich you'll certainly want one. If you're not passing won't do your collection any harm. These were released in 1999 and production ceased in 2003 which suggests to me that they weren't very popular in the first place. 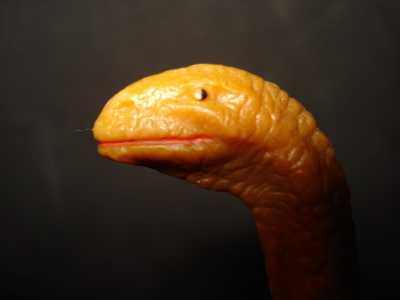 Schleich has not replaced this "hole" in their lineup. 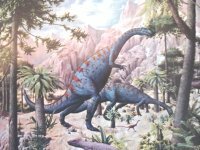 Unfortunately there simply are very few contemporary Plateosaurs around. 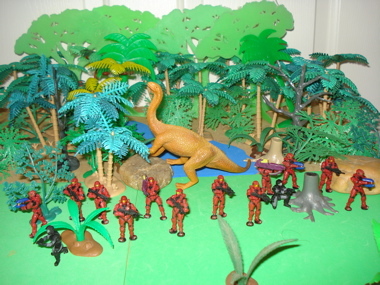 Edibility, as we have seen, seems limited to Schleich (and other's) predators although it does have the European Union "CE" indicating that it meets their health and safety standards. I still wouldn't want it in my souffle. 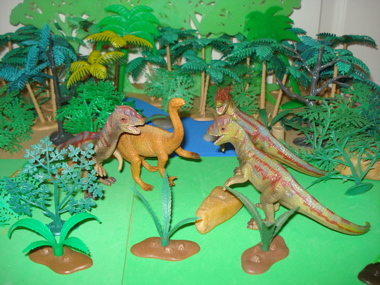 You have been reading our page about the 1999 Schleich Plateosaurus. 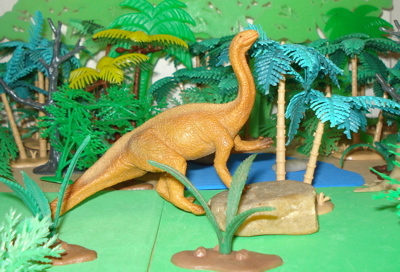 You can read about other Plateosaurus by using this link to our main Plat-page.